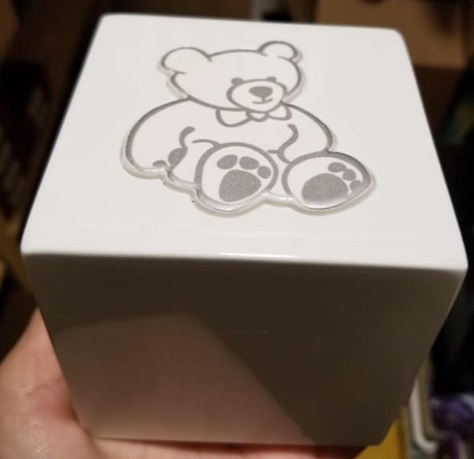 You may not want this teddy bear container as a holiday gift. It was stolen. West University Police and Crime Stoppers Houston need the public’s help in identifying and catching the suspect(s) responsible for stealing it from a home in December. According to Crimestoppers, West University Police responded to a burglary on Sunday, December 2, 2018 around 3:00 p.m., at a residence in the 2700 block of Robinhood Street in Houston. Police found the suspect (s) forced their way into the home and took some items inside. One of the items stolen was a white urn with a teddy bear etched on the top. Police believe the suspect (s) thought it was a jewelry box. Crime Stoppers is offering a reward up to $5,000 for information that leads to criminal charges and/or the arrest of the thief or thieves in this case. All anonymous tipsters can call 713-222-TIPS (8477) or submit your information online at http://www.crime-stoppers.org or through the Crime Stoppers mobile app. This entry was posted in Crime News, Houston Crime News and tagged Crimestoppers Houston, Stolen Teddy Bear Urn, West University Police. Bookmark the permalink.